San Francisco 49ers' assistant Katie Sowers isn't the only coach to beat long odds to thrive in coaching circles. Katie Sowers, the second female coach to ever coach in the NFL, knows others have had it tougher than she. Her route to reach the top of American sports' most popular game is remarkable, but every path for leaders is unique. Here are five high school coaches alone — we know there are many more — who have overcome tremendous physical or social obstacles to lead prep athletes. In no particular order, we present their journey largely through the writings of journalists throughout the nation. When the no-nonsense Randolph took over as head coach of the Coolidge (Washington, D.C.) football program in 2010, she was the third female nationally to do so at the varsity level. What made her plight a little different is being located in such a high profile region of the country. Her biggest problem originally, she said, was the media stampede. Coaching and teaching came natural. "There's always been acceptance," she said. "That's been the least of my worries. The kids had to deal more with the pressure than I did, having a female coach. ... I love coaching football. It's a labor of love. The kids are what make it worthwhile." Before the 2018 season, Johnston told his Newton (Texas) team he might not live through the end of season. He was slowing down following a 2015 double lung transplant. Johnston made it to the end of the 2018 season and his Eagles won a second straight Texas 3A-II championship at AT&T Stadium. He delivered an emotional post-game speech on live television: "I've been given a great gift, and people just don't understand that. The gift is I can see how my life could affect people before I die." W.T. Johnson talks with Fox Sports Southwest during Newton's state championship win in Dec. at AT&T Stadium in Arlington Texas. Before the 2018 season, the Sinton (Texas) football team had won 103 games over a 10-year span and won multiple regional and district titles under coach Allen. Last season, however, they struggled through a 2-8 campaign. But "struggle" is a relative term. 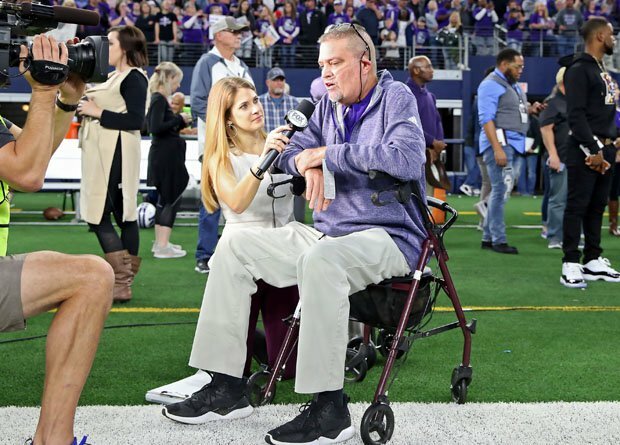 For a second season, Allen battled through Multiple System Atrophy, which has proved enlightening and inspirational for a team that gained much more than victories on a gridiron. "I see this as both a limitation and an opportunity," Allen told the Corpus Christi Caller Times. "My goal is for everyone on the team to get the most positive experience possible from this journey." Prospect (Saratoga, Calif.) head junior varsity football coach Rob Mendez was born without arms or legs and navigates smoothly around on a custom made wheelchair. His inspirational story has been told many times over the last five years, including a 30-minute ESPN documentary entitled "Who Says I Can't," released last month. "He's kind of like the light in a dark room," his father Robert Mendez told San Jose Mercury News reporter Darren Sabedra. Said Rob Mendez: "The fight in life, I can relate to the fight on the field. Hopefully show them that I'm not giving up, and they can't give up on the field. We all need each other." Bill Plaschke, the award-winning columnist for the Los Angeles Times and regular on ESPN's "Around the Horn," called Roybal (Los Angeles) boys basketball coach Danny O'Fallon, the "great and powerful." Big words. But not overstated. O'Fallon led his team to its first Los Angeles City Section title during just his second season as head coach. He had spent the previous 29 as an assistant. On Dec. 1, at the start of this championship season, he was diagnosed with Stage 4 intestinal cancer. After winning the section crown, he whispered to Plasche: "This game. ... is my life." A truly heartbreaking and inspiring tale. 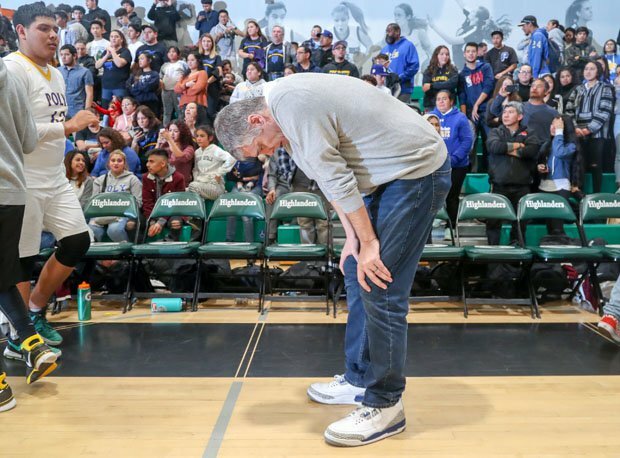 Cancer-stricken Danny O'Fallon can barely stand shortly after his Roybal team won its first Los Angeles Section championship in school history last month.